My youngest has always loved jigsaws. From a large Gruffalo one, when he really young, to a world map and a solar system, they really capture his interest and he always wants to finish them. We were asked to review some new Despicable 3 Jigsaws from Ravensburger recently. Now my youngest not only loves jigsaws but totally adores Minions too. He still adores his Tumbling Stuart which still makes us all laugh. So I knew he’d be perfect for this task – he is 8 years old. These new jigsaws are not flat but actually create 3D shapes when complete. We received a 54 piece jigsaw that becomes a pen holder and a 216 piece jigsaw that becomes a storage box. These can actually be used too. My youngest has just moved into his own room and he is very pleased with his new accessories now he has finished the jigsaws. We started with the Pencil Holder. 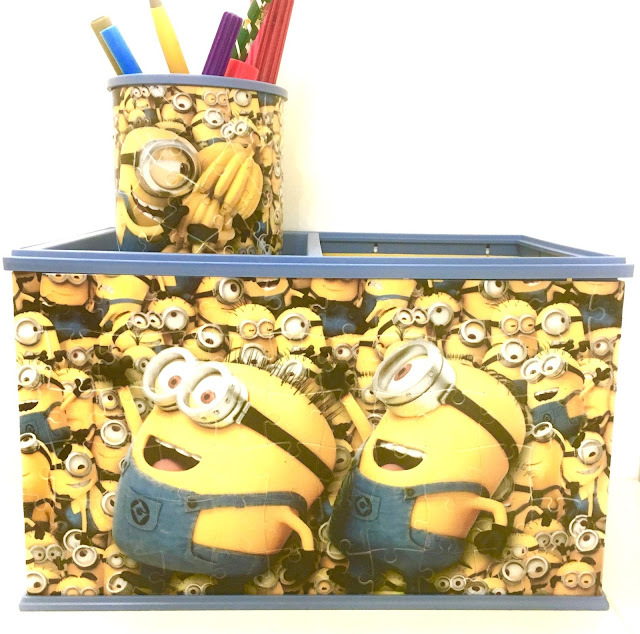 This amazing 3D Pencil Holder features the minions from the new hit film Despicable Me 3. You have to piece together the 54 curved plastic pieces. 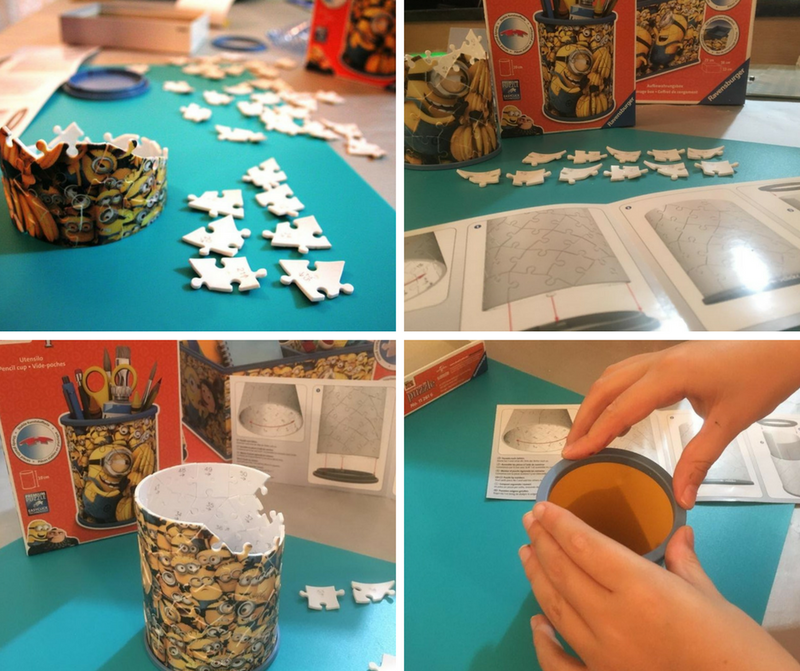 The puzzle uses unique plastic pieces, which slot together to build a sturdy and strong pot and best of all no glue is required. However is not as difficult as it sounds as they are all numbered and also have directional arrows to help you create the pencil holder. We used the numbers but if you wanted to make it more challenging you could try completing it by using the images – I do think this would be pretty difficult though, but not impossible. 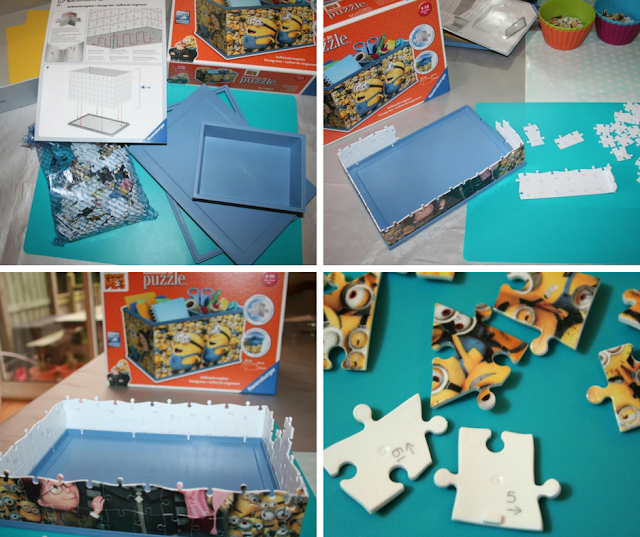 Once the jigsaw part is complete there are additional plastic and yellow cardboard accessories that come with the puzzle, these are simple to attach and when done the jigsaw can be used to store pens, pencils, make up brushes and various odds and ends. The finished puzzle measures 10cm high when complete. Suitable for ages 7 years and up. Next, we tried the Storage Box. With 216 jigsaw pieces, this had four times the number of pieces as the pencil holder, so we knew it would take longer but we’d had practice with the pencil holder, so that wasn't a problem. Again you piece together all of the parts either using the numbers and directional arrows or just by sight. Where the pencil holder had curved pieces, the storage box pieces are mostly flat like a standard jigsaw but then the corner pieces fold into a 90-degree angle to form the box. 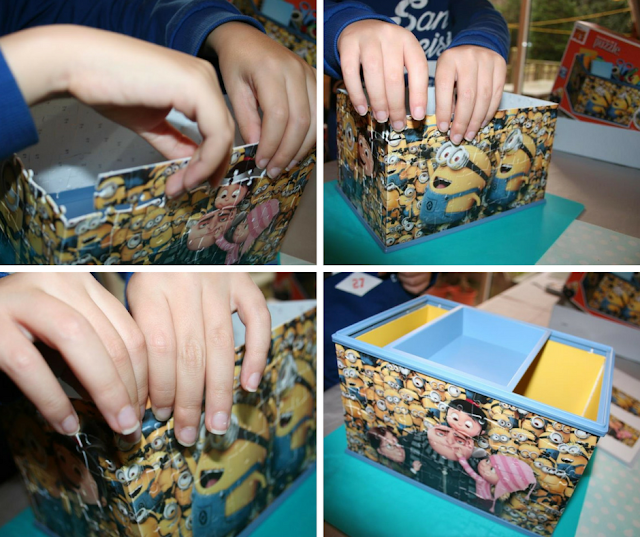 This storage box also features the mischievous minions from the new hit movie Despicable Me 3, and again comes with plastic accessories and yellow cardboard to transform the jigsaw into a storage box. The finished puzzle measures 23 x 15 x 13cm when complete. Suitable for ages 9 years and up. My youngest, aided by his slightly older brother and me, but could quite easily have completed them on his own really loves them. He had lots of fun, couldn’t wait to start on the storage box once he’d completed the pencil holder and has them very proudly displayed in his new bedroom. There is also a Despicable 3 Sneakers Jigsaw available that completes the minions set which he has asked Santa to bring on Christmas Day! I also think they are very reasonably priced. You get both a jigsaw puzzle and a bedroom accessory. The Pencil Holder is £5.95, the Storage Box £14.99 and the Sneaker also £14.99. All available from Amazon and other stores. Which is your favourite Minion? 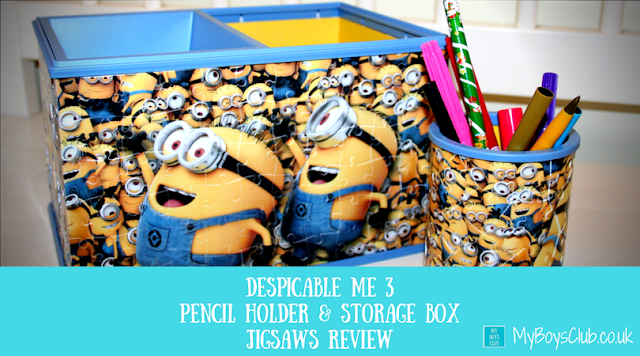 Disclosure: We received a complimentary Despicable 3 Pencil Holder and Storage Box Jigsaws from Ravensburger in return for a honest review. All content, video and photography is ours. These look brilliant. My 8 year old daughter would enjoy jigsaws like these too. Oh this likes so much fun and I'm sure any minion fan would love this. One for the nephew I think. I have clicked on the links! 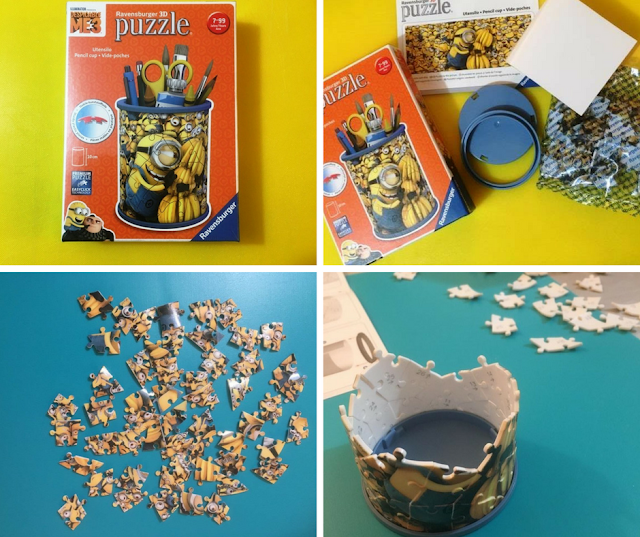 I like 3d puzzles myself and the Little Ones love minions, these are great creative yet functional too, I am off to see if they do other designs my girls would like!